POND is a research network investigating the biology underlying neurodevelopmental disorders* to create new opportunities for improved care and long-term outcomes for children. *The POND Network studies neurodevelopmental disorders such as Attention Deficit/Hyperactivity Disorder (ADHD), Autism Spectrum Disorder (ASD), Intellectual Disability (ID), Obsessive Compulsive Disorder (OCD), Tourette syndrome, Rett syndrome, Down syndrome, Fragile X syndrome or any genetic differences associated with neurodevelopmental disorder difficulties. 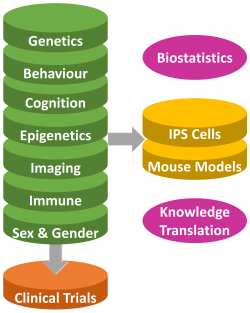 The POND Network is an Integrated Discovery Program carried out in partnership with the Ontario Brain Institute. The POND Network consists of a team of clinicians, scientists, engineers and other stakeholders from the public and private sector located across Ontario focused on advancing research and care related to neurodevelopmental disorders. The POND Network uses many types of tools and methods to better understand neurodevelopmental disorders. By understanding the biological mechanisms underlying these disorders, we can better tailor treatments based on a person’s biology. Our research is only successful through the participation and partnership of individuals with neurodevelopmental disorders, their families and the people who care for and support them both in healthcare and community settings. Check out videos from POND including talks from parent information days. Stay up to date with latest upcoming events and POND in the news.